As you will see from my regular posts on 'The Real Housewives of Melbourne', I am genuine fan of the show. Indeed, a fan of the the whole franchise since its inception: 'The Real Housewives of the OC' was the very first one, and I recall each and every 'character' since (yes, they 'play' themselves, but it is, of course, amped up a few notches to make for entertaining viewing), on each and every 'Real Housewives' series and season. However, while checking out the Twitter feed of Gina Liano this afternoon, after I'd posted a playful shot of Gina on Instagram, a screenshot of her makeup close up I'd taken yesterday following the Easter Monday 'RHOM' marathon), I was positively blown away (and not in a good way) by this highly defamatory blog post aimed squarely at bringing down RHOM cast member Gina, who has been embroiled in a very public stoush with other RHOM cast mates, in particular Andrea Moss, Lydia Schiavello and Janet Roach. It is too abrasive and abusive to quote here, so I won't. But I know you'll now want to read it before it is pulled down. And you can do that by clicking here. 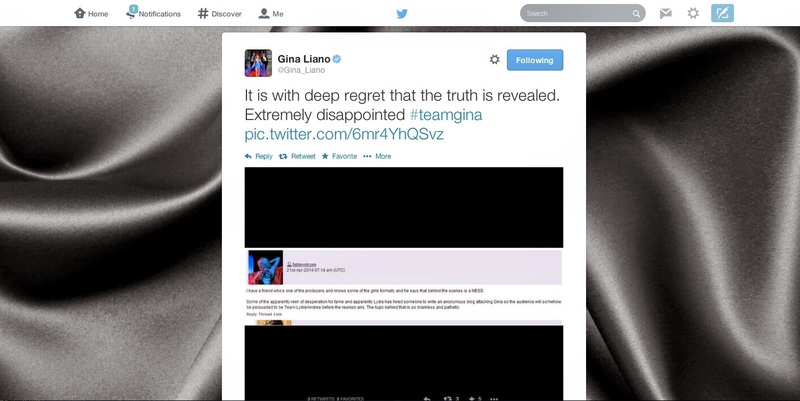 Part of the text in this screen shot, to which Gina is responding, says: "Lydia has hired someone to write an anonymous blog attacking Gina…"
Be sure to tune into the reunion show on Foxtel - see reunion show details, screen date, and social media shots here.